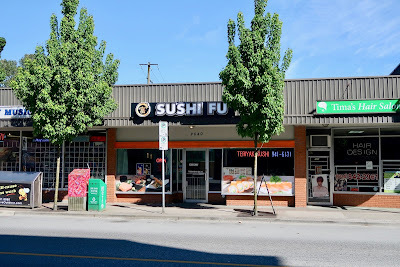 One restaurant in Port Coquitlam I have wanted to visit for a long time is Sushi K Kamizato. 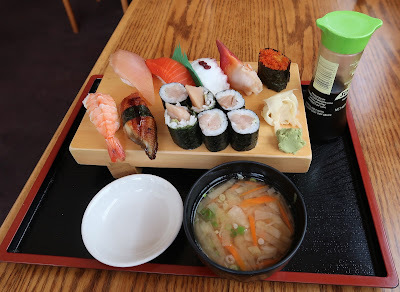 My dad and I visit Port Coquitlam for leisurely purposes every so often, sometimes to try out new sushi restaurants. Unfortunately, my dad works most evenings, and Sushi K Kamizato is only open for evenings. 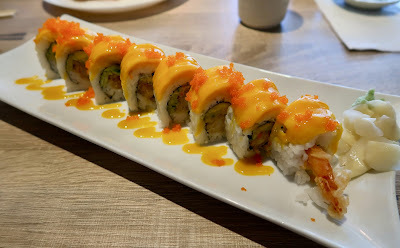 In order to satisfy my Aburi cravings on this particular occasion, we went to Sushi Fu, one of the newest additions to Port Coquitlam's constantly evolving sushi scene. 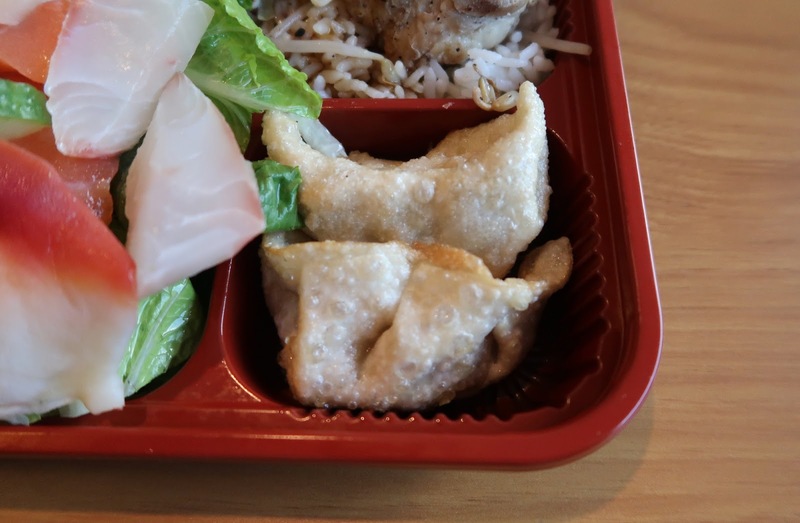 Sushi Fu is Chinese-operated and features a large, budget-friendly menu with a special that allows diners to choose 3 items (from a select list) + a bowl of miso soup for $8.50. The interior was cleanly and comfortably decorated for the most part, except for the oddly coloured walls, which were green enough for me to camouflage some wasabi without anyone noticing. Don't worry, I'm more well-behaved than that. Starting off with the Appetizer Sashimi, the salmon was soft and buttery with an excellent smooth texture. The tai was slightly tough but came with ample flavour. The tuna was the freshest, with a wonderful soft texture and a rich, non-fishy flavour. 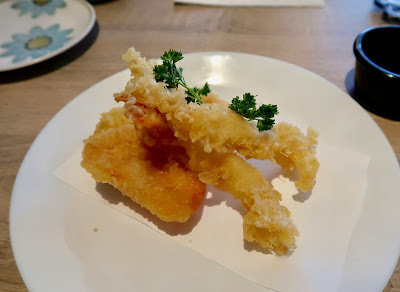 The Appetizer Tempura came with two prawns and one piece each of sweet potato, carrot, and yam. The batter was average and a bit heavy in places. The prawns were juicy though a bit thin, and the vegetables retained good flavour and moisture. The seared nigiri was surprisingly well-executed. 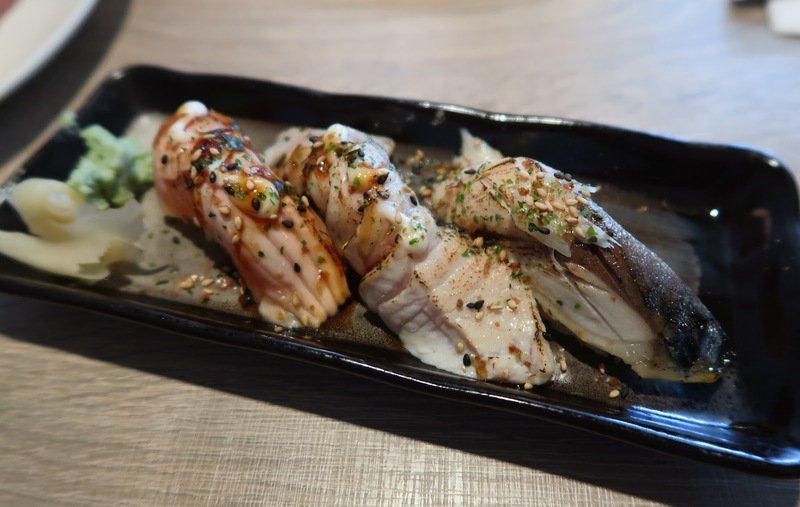 A thin layer of mayonnaise applied to each piece of nigiri really helped bring out a smoky flavour, and this was supported by a sprinkle of aromatic sesame seeds. I highly enjoyed the freshness of the salmon and the very juicy toro. The saba, besides being cut a bit too thick, was also deliciously juicy. This was one of the dishes that would make me alter my response to "excellent" instead of just "good" when asked how my food is. Since my eyes tend to gravitate towards oddly spelled things on a menu, I naturally went for the Hawawii Roll. Perhaps they were trying to replicate the very relaxing experience of playing on a Wii in Hawaii in a sushi roll rather than making a typo (although really, who actually does that on vacation?). This roll, with prawn tempura, cucumber, avocado, imitation crab, mango and fish roe, came in large, neatly constructed pieces. The roll was visually appealing, although I thought the sweetness of the mango sauce wasn't a good pairing for the savoury prawn tempura. The prawn, however, was meaty and delicious. 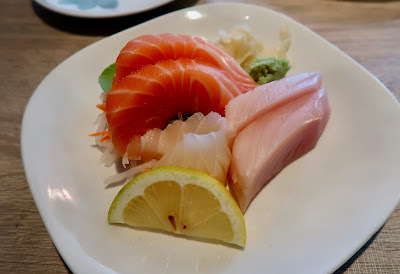 Overall, I was more than satisfied with my visit to Sushi Fu, especially given the affordable pricing. The service was also very friendly during my visit. If it weren't for the fact that Port Coquitlam isn't the most convenient for me to transit to, I can see this being a place I would visit regularly. After having lunch at Yukiya Sushi, I decided it was time for some exercise in order to burn off some of those calories. By exercise, I meant going to a hot springs pool and doing absolutely nothing for an entire hour. That moment was perhaps the healthiest I felt the entire month. By the time I got out of the pool, I felt like I had burned enough calories to resume my eating adventures once again. 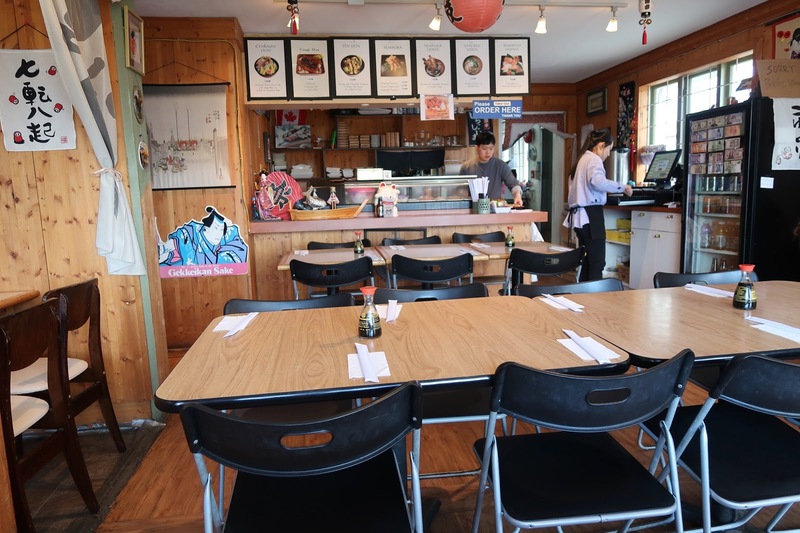 Just a few steps from the core of Harrison Hot Springs is Kitami Japanese Restaurant, serving diners who wish to have sushi in a slightly more refined setting. However, the restaurant had about as much life as an abandoned mine shaft. All the private rooms were closed off, and it took almost two minutes before someone even noticed that I had walked into the dining area. The menu was not expansive but featured most of the typical traditional Japanese dishes. The combos helped to offset the higher prices. 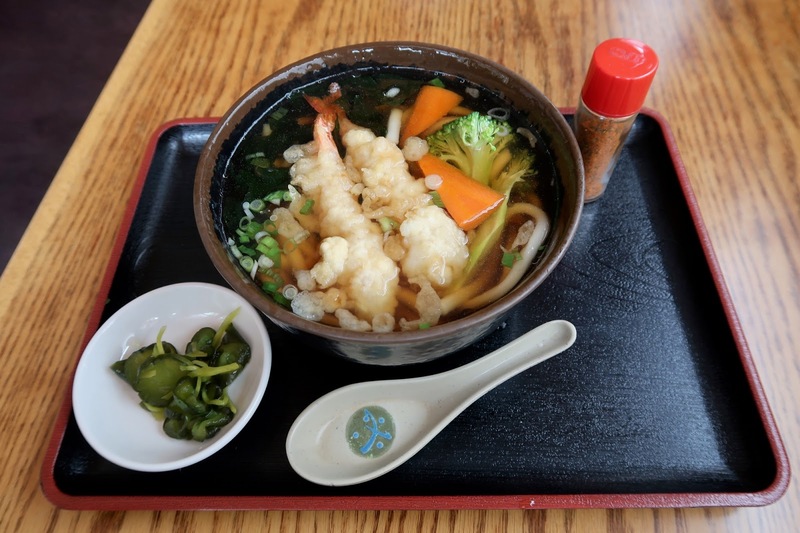 I would soon learn that the portion sizes were quite big too, as the waitress showed genuine concern when I placed my order, which consisted of only a bowl of udon and a sushi combo. The Ebi Tempura Udon came in a large bowl with two large prawns and some appropriately firm udon noodles. The prawns had a good snap, but they did not taste particularly fresh and were coated rather heavily with batter. To keep the bill reasonable, I went for the Moriawase combo, which came with 7 pieces of nigiri, a tuna roll, and a bowl of miso soup. 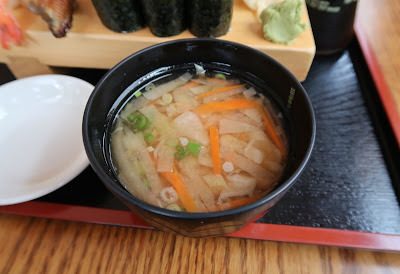 The Miso Soup came with the usual green onions and a unique mix of radish and carrot. This was good for enhancing the flavour of the soup, but I thought they could've lightened up a bit on the radish and carrot so that we can enjoy the soup itself more. The Ebi Nigiri tasted strangely sour and came with too much wasabi. 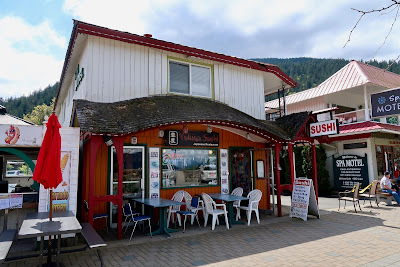 I guess the moral of the story is... avoid Ebi Nigiri in Harrison Hot Springs! 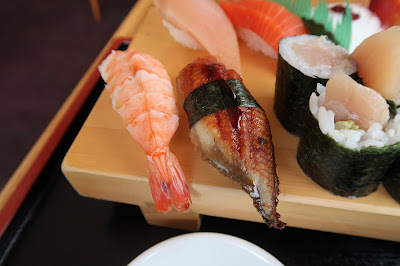 The Unagi Nigiri, on the other hand, had a pleasantly soft texture and came with rice that was not packed too tightly, although slightly dry. The Tuna Roll was neatly constructed and came with wasabi inside. The tuna had a soft texture, though it was weak in flavour. This is $5 if ordered separately. Onto the top row, the Tuna Nigiri was soft but came with mushy rice. The Sockeye Salmon Nigiri had an interesting smoked salmon flavour, while the Tako Nigiri was rather chewy. The plum sauce on the tako and the wasabi inside created a strange mix of flavours. 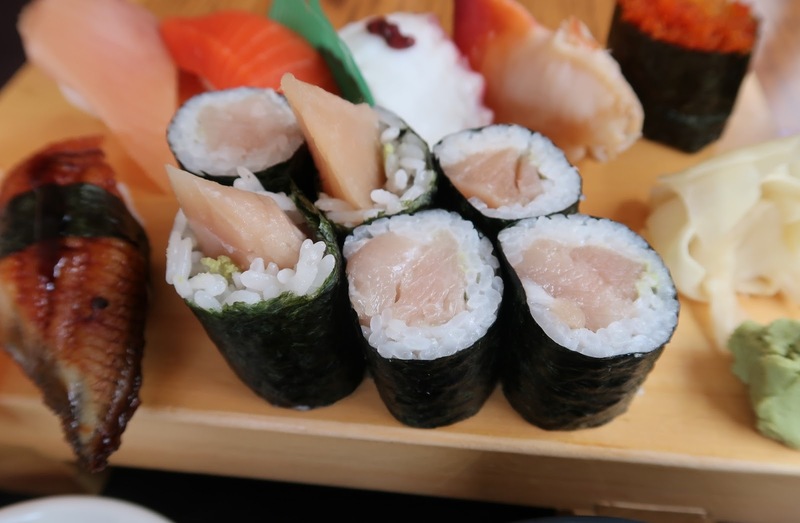 The Hokkigai Nigiri surprisingly came with two thin pieces of hokkigai, which worked to produce a rich sweetness, while the Tobiko Nigiri was perfectly bite-sized with an enjoyable bubbly texture. I found the service friendlier at Yukiya Sushi, although the quality of the food between the two restaurants was similar. With slightly higher prices at Yukiya Sushi, I cannot definitively say which is the better choice out of the two restaurants. However, I can say that both meals were very filling, and I had to do slightly more exercise the next day to burn off those calories. Well, "slightly more" just meant actually walking around instead of sitting in a tub. What do I do on a fine, sunny day with no commitments? Bussing to faraway places has always been one of my favourite pastimes, so I took the opportunity to research the farthest eastward I can bus and still make it back home on the same day. 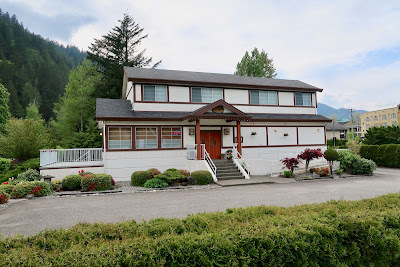 It turns out that I can bus all the way to Harrison Hot Springs. 4.5 hours of travel time to get there? No problem. Well, except for the fact that I used my phone so much along the way that I ended up at Harrison Hot Springs with 5% left on the battery... whoops. Harrison Hot Springs is home to two sushi restaurants: Yukiya Sushi and Kitami Japanese Restaurant. 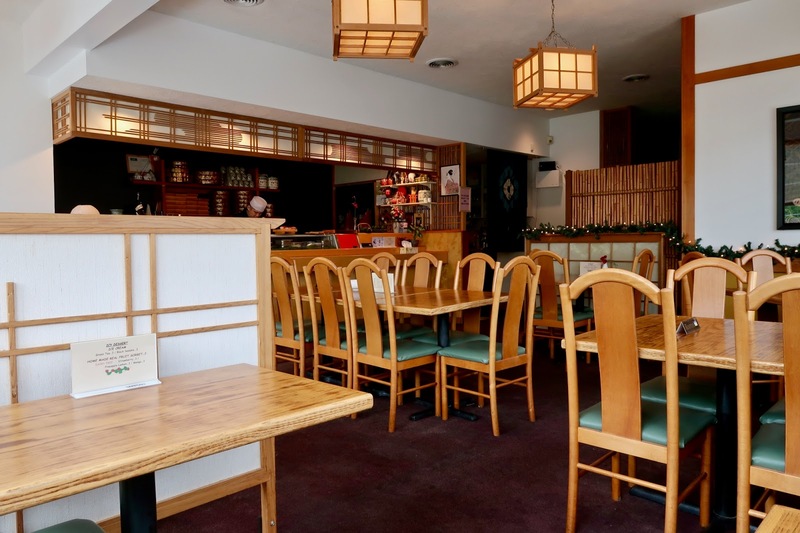 Yukiya is the more casual of the two, with basic wooden tables and a mix of folding and non-folding chairs. I heard both Chinese and Korean spoken among the staff. Fortunately, the staff were very friendly, and they made every effort to replenish my phone battery. With that, I no longer had to worry about relying on my camera for the time and the sun for the direction. I enjoyed the gorgeous view of the mountains behind Harrison Lake as I waited for my food to arrive. 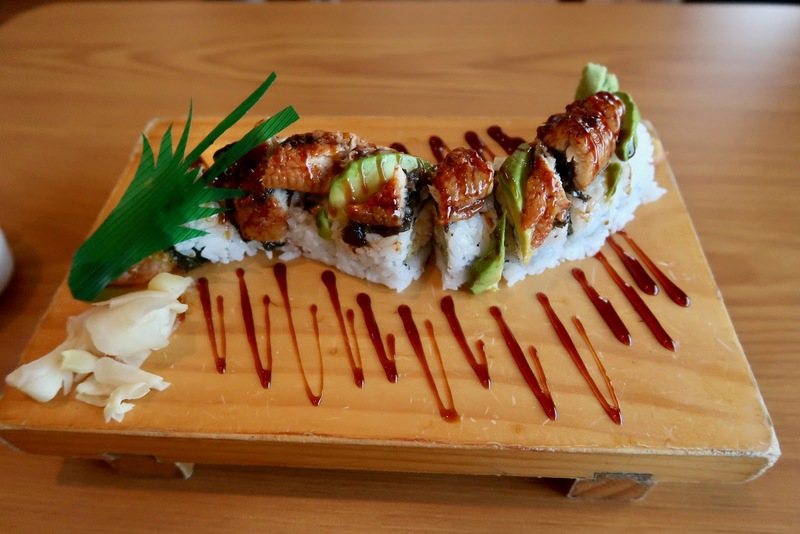 First to come was the Dragon Roll, which featured prawn tempura, imitation crab meat, BBQ eel, and avocado. At $19, this was quite expensive by Vancouver standards, but in Harrison Hot Springs, your choices for sushi are limited. The prawn tempura was pleasantly crispy, and the imitation crab meat had a nice sweetness to it. However, the avocado was not sufficiently ripe, and the unagi was not as smoky and soft as it should've been. The vinegar on the sushi rice was slightly heavy. 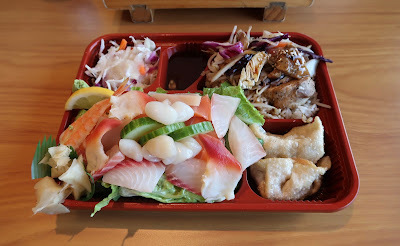 I did not expect the Chicken Teriyaki & Sashimi Bento ($19) to be particularly filling, and nothing could've prepared me for how the sashimi was presented. Never would I have expected an overflowing salad stuffed with what looked like a million different pieces of sashimi. 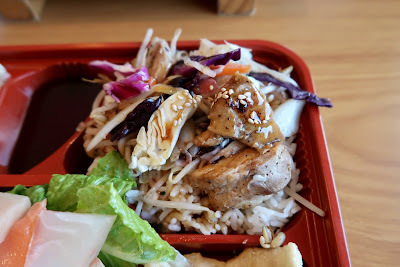 This might have been more aptly named the Chicken Teriyaki & Giant Sashimi Salad Bento. 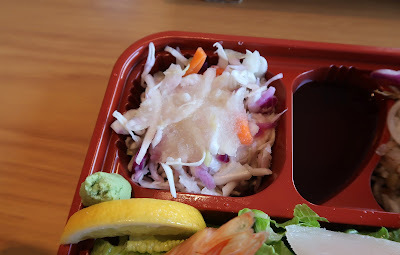 The Salad was a cabbage-based salad with a few slices of carrot inside. It was dressed with a sweet and tangy apple vinaigrette. Better flavour pairings were possible, as the acidity of the vinaigrette made it taste like something had gone bad. The Chicken Teriyaki was spiced and tender, and the black pepper sprinkled on the rice made it more flavourful. The chicken tasted like it came out of a western restaurant rather than a Japanese one, but it was decently prepared nonetheless. The two pieces of Gyoza were served at an appropriately hot temperature and primarily filled with cabbage and pork. The interior was very juicy but a tad mushy. Meanwhile, the exterior had sufficient crispiness, but parts of it tasted floury. 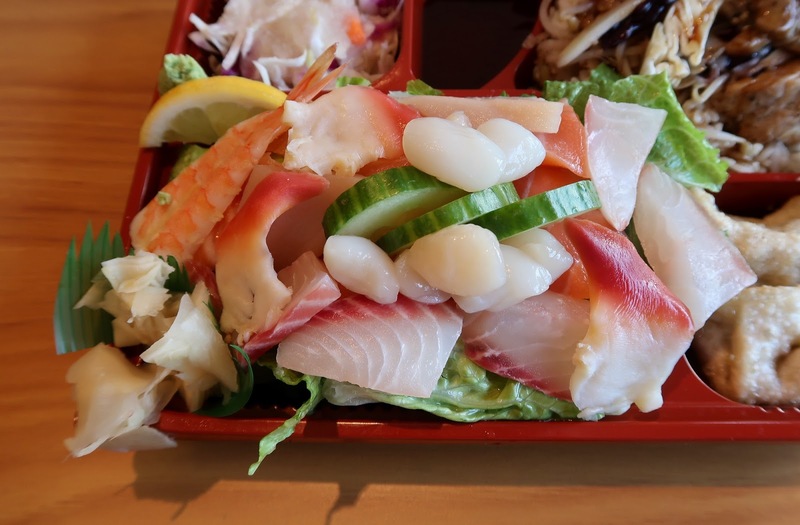 The Sashimi was assorted in terms of both variety and levels of freshness. At the top of the freshness scale was the tai (snapper), which was surprisingly soft with a delicious sweet flavour, and the salmon, which was vibrantly fresh and buttery. At the bottom was the ebi, which was rather dry and flavourless. Overall, my experience was not far from what I had expected. The food quality was not great, but I suppose it was passable. Prices were very high compared to what can be found in Vancouver, but that applies to most of Harrison Hot Springs due to higher transportation costs and lower competition.